Americans give strongly positive ratings to teachers and members of the military, while ratings of political and ideological groups – Democrats, Republicans, liberals and conservatives – are much less positive, and more starkly divided along partisan lines. Yet wide partisan and ideological divides are also seen in views of some professions. Educators – particularly college professors – tend to receive warmer ratings from Democrats than Republicans, while Republicans generally have warmer views of people in the military and law enforcement than do Democrats. A new survey of 4,904 adults conducted online Aug. 8-21 on Pew Research Center’s nationally representative American Trends Panel finds that among the public overall, people in the military receive the warmest ratings from the public – a mean, or average, rating of 83 degrees on a “feeling thermometer” between 0 and 100 – where 0 is the coldest, most negative rating and 100 represents the warmest, most positive. Teachers also are highly regarded, garnering an average rating of 78. Among the public, the mean rating for police officers is 67, but Republicans give police officers a much higher average rating than do Democrats (84 vs. 62). College professors get an overall rating of 58, but the average rating is considerably higher among Democrats (71) than among Republicans (46). Partisans sit at the lower end of the thermometer. Democrats receive an average rating of just 45 degrees among the public, while Republicans are the only group in the survey to receive a chillier rating – 41 degrees on average. Conservatives (51) receive a higher average rating than do liberals (47). While liberals and Democrats receive similar ratings (47 and 45, respectively), the overall public views conservatives (51) more positively than Republicans (41). Though Republicans and Democrats alike view people in the military warmly, the average is higher among Republicans (92) than Democrats (82). Conversely, while teachers are highly regarded across the political spectrum, on average Democrats feel more warmly toward them than do Republicans (86 vs. 72). The wide partisan gaps in views of police officers and college professors are reflected in the differences in the relative rankings (among eight groups tested) among Republicans and Democrats. Among Republicans, only military members receive a higher average rating than do police officers. In fact, Republicans rate police officers (84) higher than they do Republicans (70). Among Democrats, four groups are rated significantly higher than police officers (62), including Democrats (71). Among Republicans, ratings of members of the parties and ideological groups (liberals, conservatives) are fairly similar: Conservatives (72 on average) and Republicans (70) garner positive ratings, while the average ratings for liberals (26) and Democrats (23) are almost equally low. This stands in contrast to views among Democrats. While Democrats give both their fellow partisans and liberals positive ratings, their views of Democrats are significantly more positive than their views of liberals (an average of 71 vs. 64). Similarly, while Democrats have cold views of both conservatives and Republicans, their views of Republicans are chillier than of conservatives (an average of 24 vs. 41, respectively). While Republicans and Democrats continue to express warm feelings toward the members of their own parties, ratings of the opposing party’s members have grown more negative over the last year. Both Republicans and Democrats feel more “coldly” toward each other than in 2016. Today, 76% of Republicans have a cold view of Democrats (rating them 0-49 on the 0-100 scale), with about half (53%) rating Democrats very coldly (0-24). Very cold ratings for Democrats among Republicans are higher today than in December 2016 (33%), after the election, or in March of last year (46%) during the primary campaign. Democratic views of Republicans show a similar pattern. 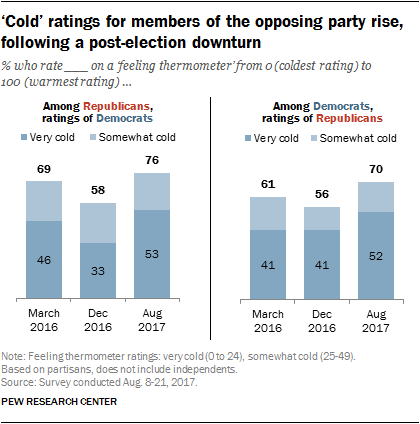 Today 70% of Democrats have a cold view of Republicans, up from 56% in December and 61% in March; very cold ratings (currently 52%) are higher than at earlier points (41% in both December and March). When it comes to ratings of the party they identify with, roughly seven-in-ten of both Democrats (72%) and Republicans (70%) give their party a warm rating on the scale (51 to 100). But Democrats are more likely than Republicans to view their own party very warmly (45% vs. 39%). 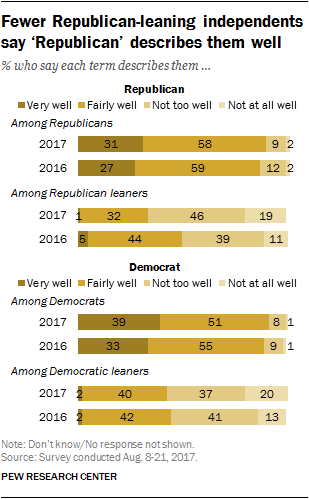 Among independents, both Republican and Democratic leaners feel negatively about the opposing party, but not very warmly toward the party they lean toward. Just 34% of Republican leaners give Republicans a warm rating (compared with 70% of Republicans). Similarly, 38% of Democratic leaners (vs. 72% of Democrats) rate Democrats warmly. Most Republicans and Democrats view fellow members of their party warmly. But when asked how well the partisan label fits them personally, more continue to say it applies fairly well than very well. Still, Democrats in particular are somewhat more likely today than they were last year to say the term “Democrat” describes them very well: 39% say this today, compared with 33% in March 2016. Another 51% of Democrats say the term describes them fairly well. Even fewer Republicans (31%) say the term “Republican” applies very well to them; most Republicans (58%) say it describes them fairly well. The share of Republicans who say they are described well by the term is largely unchanged from last year. However, there has been a sizable decline in the share of Republican-leaning independents who say the label “Republican” describes them well. In general, those who lean to a party, rather than affiliate with it, are less likely to embrace a partisan label. But among Republican leaners, just a third say the term Republican describes them very or fairly well; most (65%) say it describes them not to well or not at all well. This is a major shift from last year, when nearly half of Republican leaners (48%) said the descriptor Republican fit them well. Among Democratic leaners, there has been very little change in these views since 2016 (45% then, 42% today). 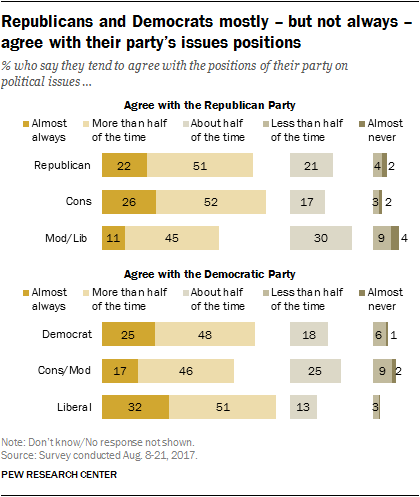 In thinking about the issue positions of the two parties, majorities of Republicans and Democrats say they agree with their own party “almost always” or “more than half the time” – and very few agree with the opposing party’s positions. These views are little changed since last year. Among Democrats, there is a similar level of agreement with the party’s positions: 73% say they agree with the party almost always or more than half the time. In both parties, there are ideological divisions in agreement with the party’s positions. Conservative Republicans are far more likely than moderate and liberal Republicans to say they frequently agree with GOP positions. Among Democrats, more liberals than moderates and conservatives say the same. Both Republicans and Democrats have largely positive views of members of the military and police officers, though in both cases Republicans’ ratings of the groups are warmer than Democratic ratings. Fully 93% of Republicans have a warm rating of people in the military, including 86% who give a very warm rating (76 or higher on the 0-100 scale). Though Democrats are less intensely positive than Republicans about members the military, 82% give a warm rating – including 69% who view service members very warmly. Among Democrats, there is a notable ideological difference in these views. About nine-in-ten (91%) conservative and moderate Democrats rate military members warmly, including 81% who give very warm ratings. By comparison, 73% of liberal Democrats view people in the military warmly (including 56% who view them very warmly). The partisan divide is more pronounced in views of police officers. Overall, 64% of the public views police officers warmly, 16% give them a neutral rating, while 18% view them coldly. 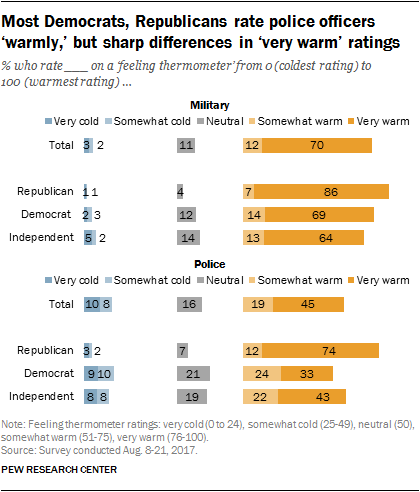 While 86% of Republicans give officers warm ratings – and about three-quarters (74%) view them very warmly – a smaller majority of Democrats (57%) view officers warmly, and just 33% give them very warm ratings. Independents’ ratings are similar to Democrats (65% warm, 43% very warm). Still, only about two-in-ten Democrats (19%) or independents (16%) view officers coldly. Teachers are viewed warmly across the political spectrum. Overall, 77% give teachers warm ratings, including 69% of Republicans, 73% of independents and 90% of Democrats. Although there is a partisan divide in views of teachers, there is a considerably wider one in views of college professors. Overall, college professors are viewed warmly: 49% give professors either a very warm (33%) or somewhat warm (16%) rating, 26% give professors a neutral rating, while 24% give them either a very cold (16%) or somewhat cold (8%) rating).